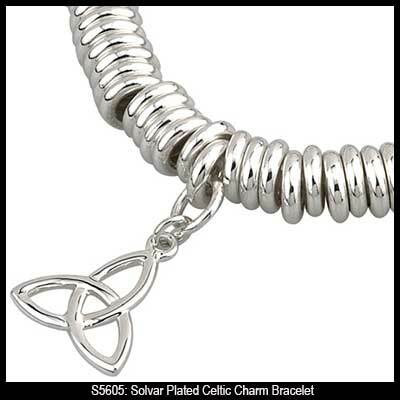 Celtic bracelet is a silver plated piece that features a Trinity knot charm. This silver plated Celtic bracelet is a stretch design that features 5/8" wide Trinity knot charm. The elastic Trinity charm bracelet has an elastic cord is covered with silver plated rings and it will fit most adult women's wrists. 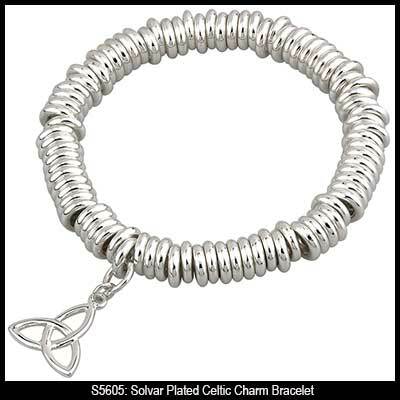 The Irish bracelet is made by Solvar Jewelry in Dublin, Ireland and it is complete with a Celtic knot history card, complements of The Irish Gift House. Celtic bracelet features a sterling silver filled glass heart with a spiral motif along with a Trinity knot charm. Shamrock and Celtic bracelet features whimsical charms that are accented with enamel and crystal. Irish bracelet features Claddagh, Celtic and shamrock charms with a silver plated finish. Connemara marble bracelet is a plated stretch design that is enhanced with a Celtic charm.